Push to talk voice chat. Is there a better alternative to Push To Talk? Is Push To Talk really the best app in Chat category? Will Push To Talk work good on macOS 10.13.4? 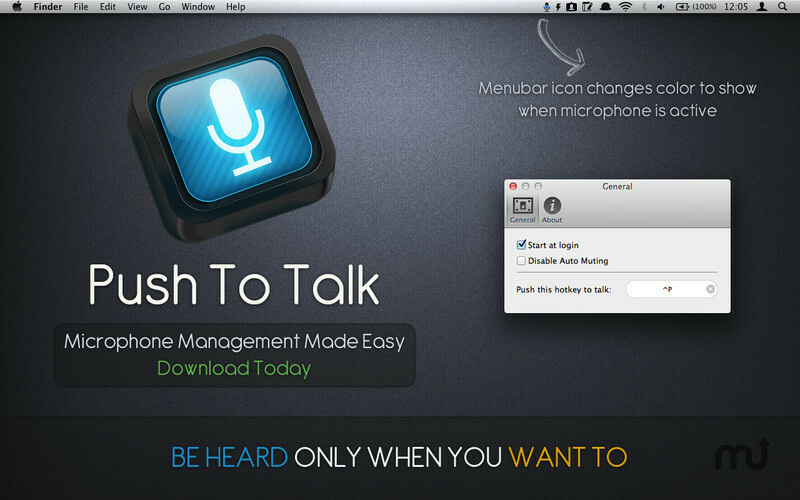 Push to Talk is a slick and unobtrusive menu bar app that makes voice chats worry-free and keeps the flow of conversation clear. Simply press the user-configurable hotkey when you want to activate your microphone, and then release when you want the microphone to be muted again. Push To Talk needs a review. Be the first to review this app and get the discussion started! How does Push to Talk work? The app simply mutes your microphone until you hold down a hot key (user selectable) on your keyboard. Hot key pressed, you can then chat on any voice client or record your voice knowing you are only transmitting audio via your microphone when you actually want to. Push to Talk works with all software that captures/transmits audio from your microphone (such as Skype, FaceTime, Audacity, etc. ).